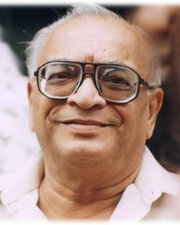 GLAofNA mourns the passing of Shri Suresh Dalal « Gujarati Literary Academy of N.A. This entry was posted on ઓગસ્ટ 10, 2012 at 6:01 પી એમ(pm)	and is filed under સમાચાર. You can follow any responses to this entry through the RSS 2.0 feed. Both comments and pings are currently closed. of his work far exceeded most other modern poets, it was not also sprinkled with numerous sparks of brilliance. He will be sorely missed. may God grant him eternal peace. Please reada correction in the above comment. Sureshbhai’s work was “Not lacking in numerous sparks of brilliance” and “Not also Sprinkled” as mistakenly written in teh above comment!